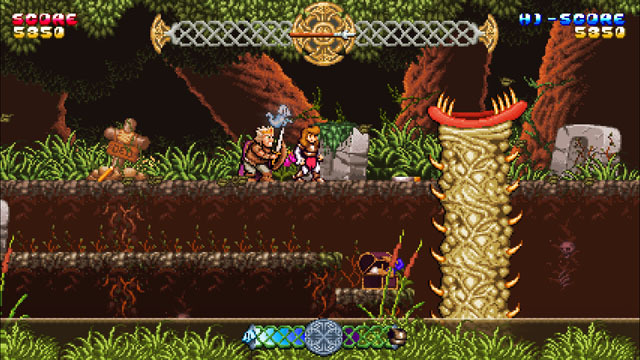 Battle Princess Madelyn is from Causal Bit Games, the developers behind the dark and gritty Insanity's Blade, a game inspired by late 80's arcade games like Black Tiger and Ghouls 'n Ghosts. The game got its start as the developer's daughter enjoyed watching her dad play the first level of Ghouls ‘n Ghosts over and over so she could watch him fight what she called "Green Head", the first level boss. And, while her dad couldn't exactly put her into GnG, he could make her the star of her own GnG-style game, and so Battle Princess Madelyn was born. The game begins as Maddi's village comes under attack, and an evil wizard kidnaps her family and kills her dog. Despite being a kid, she puts on some armor and heads out to to kill the wizard, tossing projectiles like King Arthur before her (with a very similar animation). Accompanied by the ghost of her dead pooch, she cuts a swath through the undead and other monstrous creatures, with the ghost dog firing projectiles behind her, which change depending on what armor she's wearing. The player plays through a variety of dark and atmospheric environments, facing off against huge bosses along the way, until he eventually reaches the end... and is sent back to the start of the game in GnG tradition. The developer has not yet announced which platforms the game will be available on, but he is planning to output to consoles and handhelds first, with a PC version following, although there is no announced release date for any of the versions. In the meantime, check out the extensive prototype game trailer below.